Biological soil crusts (BSCs) can dominate surface cover in dry lands worldwide, playing an integral role in arid land biogeochemistry, particularly in N fertilization through fixation and cycling. Nitrification is a characteristic and universal N transformation in BSCs that becomes important for the export of N beyond the microscopic bounds of the crust itself. The contribution of ammonia-oxidizing bacteria (AOB) in BSCs has been shown, but the role and extent of the recently discovered ammonia-oxidizing archaea (AOA) have not. We sampled various types of crusts in four desert regions across the western United States and characterized the composition and size of ammonia-oxidizing communities using clone libraries and quantitative PCR targeting the amoA gene, which codes for the ammonia monooxygenase enzyme, universally present in ammonia-oxidizing microbes. 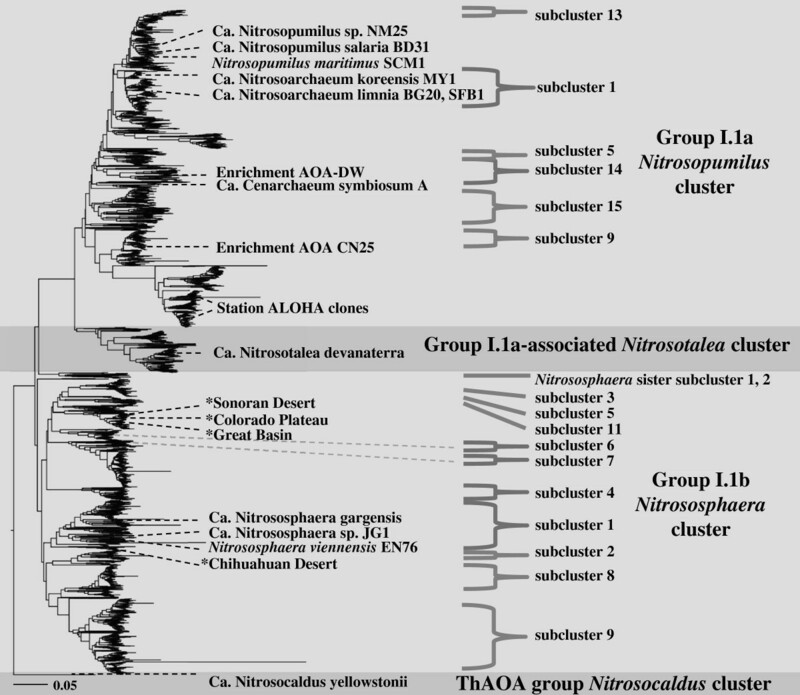 All archaeal amoA sequences retrieved from BSCs belonged to the Thaumarchaeota (Nitrososphaera associated Group I.1b). 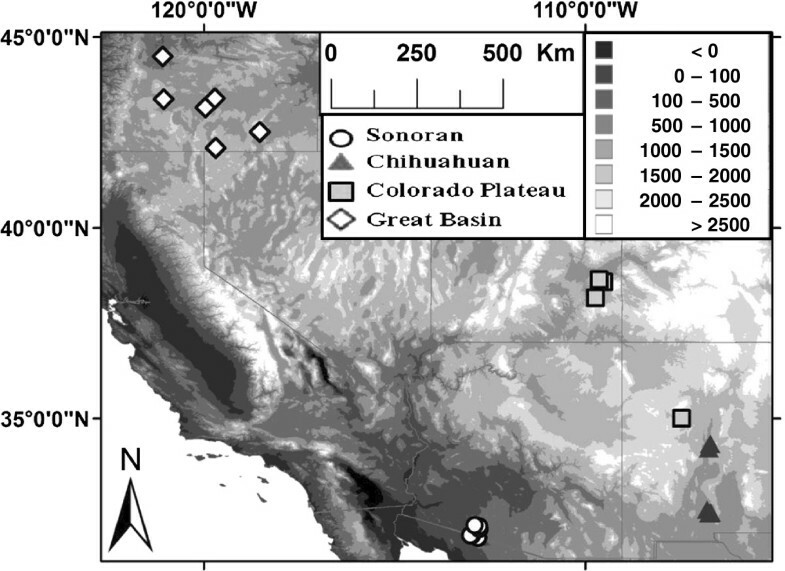 Sequences from the Sonoran Desert, Colorado Plateau, and Great Basin were indistinguishable from each other but distinct from those of the Chihuahuan Desert. Based on amoA gene abundances, archaeal and bacterial ammonia oxidizers were ubiquitous in our survey, but the ratios of archaeal to bacterial ammonia oxidizers shifted from bacterially dominated in northern, cooler deserts to archaeally dominated in southern, warmer deserts. Archaea are shown to be potentially important biogeochemical agents of biological soil crust N cycling. Conditions associated with different types of BSCs and biogeographical factors reveal a niche differentiation between AOA and AOB, possibly driven by temperature. Plant inter-spaces in arid lands are typically colonized by biological soil crusts (BSCs), which in some areas can cover large portions of the landscape (Belnap1995; Pointing and Belnap2012). Pioneering cyanobacteria, such as Microcoleus vaginatus, initiate the formation of BSCs by stabilizing loose soils (Garcia-Pichel and Wojciechowski2009), allowing a succession that involves other bacteria (Garcia-Pichel et al.2001; Gundlapally and Garcia-Pichel2006; Nagy et al.2005), archaea (Soule et al.2009), and fungi (Bates and Garcia-Pichel2009; Bates et al.2012), as well as lichens and mosses in well-developed crusts (Belnap and Lange2003). Functional roles for the majority of nonphototrophic microbes inhabiting BSCs are not known, however, and remain to be established experimentally. BSC topsoil assemblages are considered “mantles of fertility” (Garcia-Pichel et al.2003) as they play important roles in biogeochemical processes within arid ecosystems (Belnap and Lange2003; Evans and Johansen1999; Strauss et al.2012), fixing an estimated 0.1 Pg of C and 10 Tg of N annually across the globe (Elbert et al.2012). Nitrification (with ammonia oxidation as its rate-limiting step) mediated by BSC microbes is another important component of arid land nutrient cycling that directly impacts soil fertility and rivals N-fixation in its magnitude (Johnson et al.2005). Nitrifiers, such as Nitrosospira, have been recovered from BSCs in molecular surveys, and most probable number assessments suggest ammonia-oxidizing bacteria (AOB) are numerically abundant in BSCs (Gundlapally and Garcia-Pichel2006; Johnson et al.2005). Although archaea are likely important soil ammonia oxidizers (Leininger et al.2006; Zhang et al.2010; Bates et al.2011; Stahl and de la Torre2012) and sizable archaeal populations have been reported from BSCs (Soule et al.2009), little is known about the role of archaea in the arid land N-cycle. Recent research has improved our understanding of factors that drive the dynamics between archaeal and bacterial ammonia oxidizers in soils. For example, alkaline soils and lower NH4+ concentrations may favor some ammonia-oxidizing archaea (AOA) over their bacterial counterparts (Gubry-Rangin et al.2011; Martens-Habbena et al.2009). Although desert soils are typically characterized by these conditions, few studies have specifically examined AOA in BSCs or the factors that structure communities of N-cycling microbes in arid lands (e.g., Johnson et al.2005,2007; Marusenko et al.2013). As approximately one-third of the terrestrial surface is arid or semi-arid land, and BSC cover can be substantial, understanding the dynamics of nitrification mediated by crust microbes has relevance to the global N-cycle. Considering the potential for archaea to play an important role in arid land nitrification as ammonia oxidizers, we assessed the diversity and abundance of archaeal amoA genes in BSCs within four biogeographically distinct deserts in the western United States. For comparison, we quantified the abundance of bacterial amoA genes and estimated the portion of AOA and AOB in these BSC microbial communities using published determinations of archaeal 16S rRNA genes from the same samples (Soule et al.2009). We also examined the role of environmental factors, particularly those associated with latitudinal gradients, in structuring these communities of crust ammonia oxidizers. We sampled different crust types (e.g., those dominated by cyanobacteria, lichen, or moss) in a variety of geographically dispersed sites (Figure 1, Additional file1) across four distinct desert systems in the western United States, including the Great Basin, Colorado Plateau, Chihuahuan Desert, and Sonoran Desert (listed in order of increasing temperature; Belnap and Lange2003). The mean annual temperature across the four desert regions sampled ranged from 4°C to 22°C. These crust samples were previously characterized for archaeal diversity (Soule et al.2009) based on 16S rRNA genes. For sampling, the bottom portion of a 55 mm Petri plate was used to excise a circular portion of the crust matrix (to a depth of ~ 1 cm) after wetting with a mist of sterile ultra-pure milli-Q water in order to make the crust supple to facilitate collection. All samples were allowed to air-dry, given a unique identification number, sealed in Zip-lock plastic bags for transport, and then stored dry in the lab’s repository at room temperature, as recommended for arid land soil samples (Campbell et al.2009), until DNA extraction. Approximately 1 g of the crust matrix was aseptically transferred to microcentrifuge vials of the Ultra Clean Soil DNA Isolation Kit (MoBio Laboratories, Carlsbad, CA, USA), and standard protocols were used in DNA extraction following the kit instructions. All extracts were stored at −80°C until use in downstream applications. Map of study sites in arid lands of western North America. Legend grayscale shows elevation of the terrain (meters). Clones were obtained from PCR products of community DNA using the amoA primers (position 4–23 and 619–638) and protocol described by Francis et al. (2005). Primers designed to hybridize at the ends of the amoA gene are good options for general assays and have been successfully used for soils (Chen et al.2008; Mao et al.2011; Nicol and Prosser2011). One clone library was constructed for each desert region by pooling extracts from at least 10 individual sites. All PCR products were checked for quality against an EZ Load Precision Molecular Mass Ruler (Bio-Rad Laboratories, Hercules, CA, USA) on 1% agarose gels (with a TAE buffer base) by standard gel electrophoresis, followed by ethidium bromide staining and imaging using the Fluor-S MultiImager system (Bio-Rad Laboratories). Products were then purified for ligation using the QIAquick PCR Purification Kit (Qiagen Sample and Assay Technologies, Valencia, CA, USA) prior to constructing the libraries using the TOPO TA Cloning Kit (Invitrogen, Carlsbad, CA, USA) in accordance with the manufacturer’s specifications. Cloning and transformation success were verified through PCR with 1 μl of clone-containing media as the template DNA. The clones obtained were then sequenced in the forward and reverse directions at a commercial laboratory. Phylogenetic analyses were carried out on a single alignment file that included amoA gene sequences from our clone libraries (one representative sequence from each amoA phylotype that was recovered from the four deserts) as well as reference groups of AOA retrieved from GenBank and originating from previous studies (Venter et al.2004; Konneke et al.2005; Hallam et al.2006; Hatzenpichler et al.2008; de la Torre et al.2008; Walker et al.2010; Park et al.2010; Tourna et al.2011; Matsutani et al.2011; Jung et al.2011; Blainey et al.2011; Lehtovirta-Morley et al.2011; Santoro and Casciotti2011; French et al.2012; Mosier et al.2012). Additionally we included 3,619 high-quality sequences from the Dryad data repository (see sequence quality filtering by Fernandez-Guerra and Casamayor2012a). All sequences were combined and realigned using MAFFT (Katoh et al.2002) and analyzed with the phylogenetic tree building module of the MEGA 5 software package with the following parameters: neighbor-joining statistical method, Jukes-Cantor nucleotide substitution model, bootstrapping for 100 replicates, uniform rates, and complete deletion of gaps/missing data (Tamura et al.2011). Representative sequences of novel archaeal amoA genes from each of the deserts have been submitted to GenBank (NCBI accession numbers: Sonoran, EU439775; Great Basin, EU439776; Colorado Plateau, EU439777; Chihuahuan, EU439778). For use in quantitative PCR (qPCR), we developed archaeal-specific amoA primers based on sequences obtained from our clone library work (those known to be present in our BSC samples) as well as those available in public databases. These primers, amoA310f (5′-TGGATACCBTCWGCAATG-3′) and amoA529r (5′-GCAACMGGACTATTGTAGAA-3′), were designed to yield PCR products of approximately 220 bp, of optimal length for qPCR. This primer set was then used for qPCR in 20 μl reactions that contained the following: 10 μl iTaq SYBR Green Master Mix (Bio-Rad Laboratories), 300 nM amoA310f/amoA529r, and 10 ng of environmental DNA. The reaction conditions had an initial denaturation step of 2.5 min at 95°C followed by 55 cycles of 15 s at 95°C and 1 min at 54°C, and a final dissociation step later used to check the fidelity of the qPCR results. For quantification, a standard curve (log-linear R2 > 0.97) was generated using a purified, linearized, and quantified archaeal amo A clone plasmid in a dilution series that spanned from 101 to 109 gene copies per reaction. Bacterial amoA qPCR was carried out in 20 μl reactions using primers amoA-1f and amoA-2r (Rotthauwe et al.1997) at a final concentration of 500 nM, along with 10 μl iTaq SYBR Green Master Mix and 10 ng of environmental DNA. The reaction conditions were as follows: initial denaturation for 2.5 min at 95°C followed by 45 cycles of 15 s at 95°C and 1 min at 55°C, and a final dissociation step. A standard curve for quantification (log-linear R2 > 0.95) was generated using genomic DNA from Nitrosomonas europaea ATCC 19718 (Chain et al.2003) in a dilution series that spanned from 101 to 109 gene copies per reaction. Multiple measures were taken to ensure quality qPCR data. All reactions for both archaeal and bacterial amoA qPCR runs were carried out in triplicate to account for analytical variability. Triplicates were averaged prior to any data calculations reported in the results. Melting curves obtained in the denaturation step were visually inspected to verify the quality of each reaction and to insure the absence of primer-dimers. Reported results contain only determinations for which Ct values could be interpolated within our standard curves, and failed or suspect reactions (those with questionable melting curves) were excluded from the data set. We downloaded environmental data from the Commission for Environmental Cooperation for elevation and climate (years 1950–2000; CEC,http://www.cec.org) and used ArcGIS version 10.1 to extract exact values (for environmental data) corresponding to coordinates from the sites used in this study (Additional file1). Canonical correspondence analysis (CCA; Ter Braak1986; Palmer1993) was used in the Palaeontological Statistics (PAST; Hammer et al.2001; Fu et al.2006) software package to explore associations between environmental factors [e.g., mean annual temperature (MAT) and mean annual precipitation (MAP)] and the dependent variables. The three dependent variables used were amoA gene abundances (archaeal, bacterial) and the archaeal to bacterial amoA ratio. Statistical tests were carried out using SPSS (version 20.0 for Windows). Linear model assumptions were tested using Shapiro-Wilk and SPSS normal probability plots (for normality) and Levene’s test (for homoscedasticity), and data were transformed (natural log) when necessary. Bivariate Pearson correlation and linear regression analyses were performed to assess significance of relationships between amoA data and environmental factors throughout the four desert regions (Hocking1976). Significant differences of regression slopes across environmental gradients in replicated data for gene copy numbers were analyzed as a multiple linear regression (multiple dependent variables, one independent variable). Due to co-correlation of external factors (latitude positively correlated with elevation and MAP, and negatively with MAT), regressions were carried out separately for each independent variable to assess the potential effect of each variable without being able to interpret the combined effects of multiple variables (Smith et al.2009). The sets of dependent variables were archaeal amoA, bacterial amoA, ratio of archaeal to bacterial amoA, separately for the simple linear regression, and archaeal amoA vs. bacterial amoA in the multiple regression. To obtain a geographically integrated survey of the diversity in archaeal amoA genes, we analyzed clone libraries representing each of the four distinct desert systems across the western U.S. (Chihuahuan, Great Basin, Colorado Plateau, and Sonoran). Analysis of clone libraries, with more than 40 clones in each desert, revealed that monophyletic amoA gene populations corresponding to each desert region exist in arid land BSCs: only a single archaeal amoA phylotype was recovered from each desert (98.5–100% nucleotide similarity). Phylogeny (Figure 2) of the four representative sequences revealed that phylotypes from three of the deserts (Great Basin, Sonoran, and Colorado Plateau) were indistinguishable, grouping in a well-defined clade (>95% similarity, 76% bootstrap support), while a lone sequence type (representing the Chihuahuan Desert) was distinct (only 81% similarity to other amoA gene sequences obtained from BSCs). 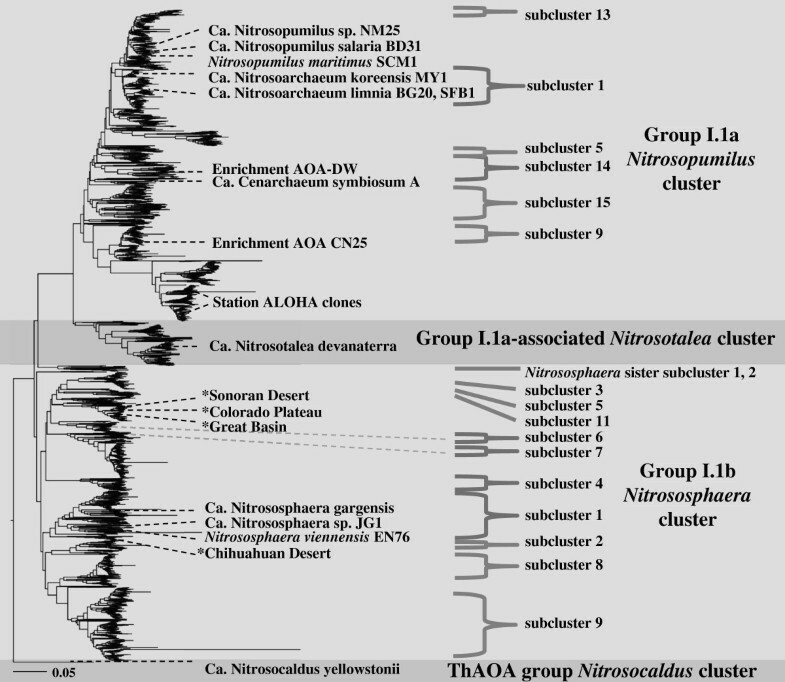 All four phylotypes, however, are part of the Group I.1b Nitrososphaera cluster as identified by Pester et al. (2012). The Chihuahuan Desert sequence grouped near sequences representing Nitrososphaera subcluster 2, closely related to the amoA gene of N. viennensis (Tourna et al.2011; the only pure thaumarchaeotal isolate from soil), while the other three desert phylotypes were most closely related to Nitrososphaera subclusters 6 and 11. Phylogenetic tree of archaeal amoA gene sequences. Data were obtained from clone libraries of genomic community DNA isolated from biological soil crust samples in this study (indicated by an asterisk *), as well as reference sequences from GenBank for species of amoA-encoding archaea that have been characterized. Without clustering, these sequences were combined and realigned with 3,619 high-quality sequences from GenBank (Fernandez-Guerra and Casamayor 2012). Dashed lines connect the identified sequences to the position in the tree. Bracketed clustering groups are based on designations at multiple phylogenetic levels within the Thaumarchaeota as proposed by Pester et al. (2012). Population densities of putative ammonia oxidizers were assayed through qPCR of amoA genes from the four arid regions. Archaeal amoA copy numbers average around 7 × 105 per gram of soil (332 copies per ng DNA) across all desert sites (Table 1), whereas their bacterial counterparts averaged only slightly (and nonsignificantly) below this value at 3 × 105 (154 copies per ng DNA). The sizes of the AOA populations in BSCs were more variable than those of AOB, with densities of archaeal amoA genes ranging over three orders of magnitude in individual sites within each desert (ca. five orders of magnitude across all deserts), and bacterial amoA genes ranging over only one to two orders of magnitude (ca. three orders of magnitude across all deserts). 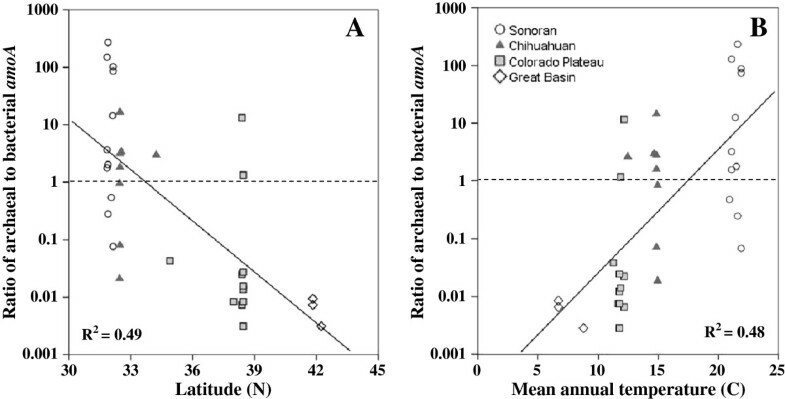 More notably, the average of the ratios for archaeal to bacterial amoA gene copy number for each desert (Table 2) were highest in the southernmost, warmer deserts (54.7 and 3.5 for Sonoran and Chihuahuan, respectively) as compared to the cold deserts of more northern latitudes (1.3 and 0.01 for Colorado Plateau and Great Basin, respectively). a In descending order n = 12, 10, 11, 6, 39. b In descending order n = 12, 8, 12, 6, 38. All qPCR data are for amoA gene copies per gram of crusted soil. a In descending order n = 11, 8, 11, 3, 33. b In descending order n = 9, 6, 10, 3, 28. c Determinations for general archaeal 16S rRNA gene copies per gram from Soule et al.2009. d Average of all ratios for the designated province. All data here are for qPCR determinations of amoA or 16S genes as copies per gram of crusted soil. CCA revealed patterns between environmental factors and ammonia oxidizers across geographical provinces encompassed by the survey (trace p value < 0.01; Figure 3). Generally, the Sonoran Desert sites are associated with higher MAT, while those of the Great Basin and Colorado Plateau sites are more positively associated with elevation and MAP. Conditions associated with lower latitudes in our dataset (i.e., higher temperatures, lower elevation, lower precipitation) were negatively related to the size of the bacterial amoA population and positively related to both archaeal amoA and the ratio of archaeal to bacterial amoA. Canonical correspondence analysis (CCA) across all study sites. The dependent variables (ammonia-oxidizing gene abundance and community data) ordinate along a gradient that is driven by vectors related to the independent variables (environmental factors). AOA/AOB, ratio of archaeal to bacterial amoA; MAT, mean annual temperature; MAP, mean annual precipitation; c, Chihuahuan Desert; p, Colorado Plateau; g, Great Basin; and s, Sonoran Desert. Correlation and regression approaches clearly confirmed distinct relationships between archaeal and bacterial amoA gene abundances of BSCs and specific environmental factors across the four deserts (Table 3). For example, archaeal amoA abundance was most strongly correlated with latitude (r = −0.53, p = 0.001). Bacterial amoA abundance, on the other hand, was most strongly correlated with elevation (r = 0.78, p < 0.001). Most revealing were the strong, significant correlations between the archaeal to bacterial amoA gene abundance ratio and a range of environmental factors: latitude, elevation, MAT, and MAP. These relationships translated into the general geographic trend of archaeal amoA gene abundance dominating over that of AOB in the warmer, more southern deserts, with AOB dominating in the more northern, colder deserts (Figure 4). 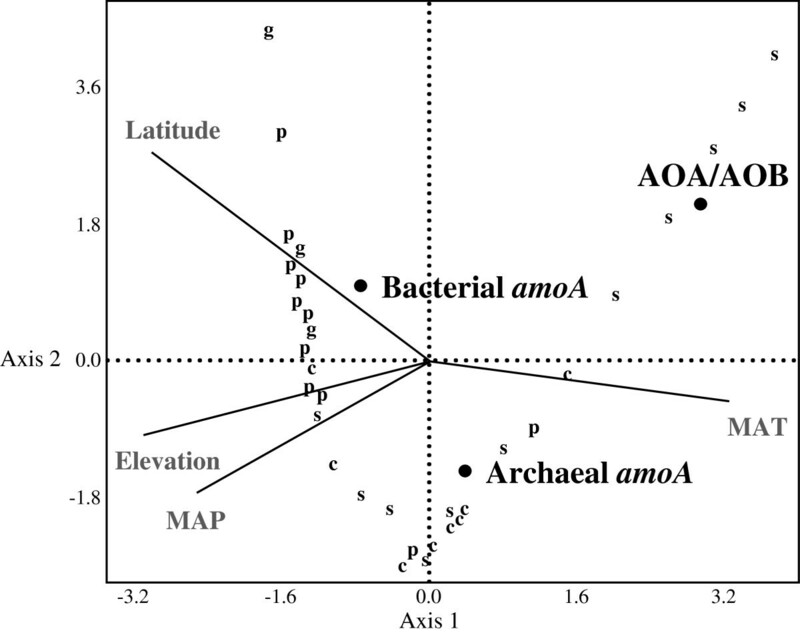 Relationship of archaeal to bacterial amoA ratio across all geographical locations. Ammonia-oxidizing community is correlated with (A) latitude and (B) mean annual temperature. Dotted line at y = 1 indicates division between archaeal vs. bacterial amoA dominance. **Correlation is significant at the 0.01 level. *Correlation is significant at the 0.05 level. MAP, mean annual precipitation; MAP, mean annual temperature. Our results show that archaeal amoA genes are conspicuously and widely represented in BSCs from several arid regions of North America, suggesting that archaea are potentially involved in the process of ammonia oxidation of these soil communities. In general, average AOA abundance in BSCs was 10- to 20-fold lower than in most other types of soils, with some overlap in range (He et al.2007; Leininger et al.2006), and less than 10-fold smaller as reported in few other environments (Chen et al.2008; Gleeson et al.2010; Zeglin et al.2011). Judged by the counts of amoA gene copies, AOA in fact outnumbered AOB when averaged over all sites. The populations of amoA-bearing archaea are, however, of low diversity based on initial surveying in these systems using clone libraries, which mirrors the findings that archaeal diversity is also generally restricted in both bulk soils (Auguet et al.2010; Fernandez-Guerra and Casamayor2012) and in BSCs (Nagy et al.2005; Soule et al.2009). We note that most publicly available sequences that had high similarity (>97% at the nucleotide level) to those of BSCs from this study originated from terrestrial environments with source soils of relatively alkaline character (Leininger et al.2006; Shen et al.2008; Zhang et al.2009,2011; Liu et al.2010; Glaser et al.2010; Fan et al.2011). Because the number of samples analyzed is not exhaustive, we cannot assert with confidence that the two main amoA phylotypes found in BSCs in this study represent crust-specific lineages, although this remains a possibility to be explored further. Other studies have shown that certain AOA lineages have adapted to specific levels of pH (Gubry-Rangin et al.2010,2011). Arid lands are characteristically extreme environments exposed to intense UV radiation, limited availability of nutrients, alkaline soils, as well as distinct seasonal changes of long desiccation periods punctuated by pulsed precipitation events (Schlesinger1997; Safriel et al.2005), all of which may help carve separate niches for soil organisms (Wall and Virginia1999). AOA dynamics may be distinct and depend on the range of a certain environmental variable (e.g., temperature gradient in only alkaline soils) in different types of BSCs and other local conditions that affect crusts (Garcia-Pichel et al.2003; Pointing and Belnap2012). What seems clear is that crust-dwelling AOA are part of a broader consortium of archaea more related to the group I.1b Nitrososphaera cluster than to any other Thaumarchaeota group. All BSC amoA archaeal phylotypes were nested within a larger group that holds the sequence from the only pure culture isolate from soil capable of chemolithoautotrophic ammonia oxidation, Nitrososphaera viennensis (Tourna et al.2011). Unexpected patterns of distribution emerged when AOA and AOB population size was related to geography. Variables that are associated with latitude become important predictors of amoA abundance. Since an AOA/AOB ratio of >10 (accounting for cell sizes, specific growth rates; Prosser and Nicol2012) suggests archaea outcompete bacteria in ammonia-oxidizing activities, such latitudinal factors likely structure communities and soil function across the dry lands surveyed here. Temperature was positively associated with AOA abundance and with the ratio of AOA/AOB, in support of other studies showing that AOA respond preferentially to elevated temperature in enrichment cultures (Kim et al.2012) and in soil microcosms (Tourna et al.2008), and correlate well with environmental temperature gradients (Bates et al.2011; Cao et al.2011), while some studies show negative or no response to temperature (Adair and Schwartz2008; Jung et al.2011). Together with our results, these findings suggest that temperature may be an important driver of niche separation for AOA, potentially leading to diverse ecosystem function responses that will depend on the magnitude of temperature change in the environment. Based on previously reported qPCR determinations of 16S rRNA gene copy numbers for archaea from the same sample set (Soule et al.2009), AOA can account but for a small proportion of the extant total population of BSC archaea. Assuming the number of copies per cell for amo A (1 for archaea, 2.5 for bacteria) and 16S rRNA genes (1 for both archaea and bacteria) as can be inferred from known genome studies (Klappenbach et al.2001; Norton et al.2002; Hallam et al.2006; Blainey et al.2011), putative AOA represent only about ~5% of the archaeal populations present in BSCs across all deserts and as little as 0.03% on average for the Great Basin samples. Even when considering possible uncertainties in these estimates stemming from primer bias (Baker et al.2003; Agoguè et al.2008), our results are consistent with other soil environments globally (Lehtovirta et al.2009; Ochsenreiter et al.2003; Schleper and Nicol2010). This clearly implies that the bulk of archaeal populations in BSCs (particularly the few dominant crust phylotypes documented by Soule et al.2009) cannot be identified as AOA, leaving the functional role for the bulk of BSC archaea as undetermined. While archaea are potentially important for nitrification processes in arid lands, AOA must then be found among the rarer, possibly as yet to be detected, members of BSC microbial communities. Microbial involvement in regulating the availability of usable forms of N and controlling productivity in pristine systems is critical for the ecosystem (Schimel and Bennett2004; van der Heijden et al.2008; Nannipieri and Eldor2009). BSCs of arid lands contain Thaumarchaeota that lose dominance to AOB with increasing latitude, from southern, warmer deserts to northern, colder climates. In some BSCs, AOB outnumber AOA by 100-fold, which to our knowledge is greater than any current report for soil environments where AOB dominate (e.g., Di et al.2009; Hallin et al.2009; Gleeson et al.2010), more closely resembling other types of ecosystems and conditions (estuary, Mosier and Francis2008; wastewater treatment bioreactor, Ye and Zhang2011). Niche differentiation plays a role amongst AOA and AOB communities in general (Gubry-Rangin et al.2011; Hatzenpichler2012), and the same may also be true for BSCs. The BSC system can be used in further research to elucidate novel aspects of ammonia oxidation and AOA, such as AOA capacity for mixotrophic growth and the potential for denitrifying ability (Bartossek et al.2010; Tourna et al.2011; Xu et al.2012). For example, phototrophic contributions in surface crusts create unique temporal and spatial gradients of pH, nitrogen, oxygen, and carbon availability (Garcia-Pichel and Belnap1996; Johnson et al.2007), which can be used to test AOA response at the microscale as well as across biogeographical regions. Overall, arid lands may provide further insight into environmental drivers of ammonia oxidation and community shifts of ammonia oxidizers, which has important implications for understanding nitrogen cycling at the global scale. We thank Moria Nagy and G.S.N. Reddy for sharing their experiences with crust archaea. We are grateful to the staff of Sevilleta and Jornada LTER sites as well as the National Park Service (Canyonlands N.P. and Organ Pipe N.M.) for providing sampling permits, guidance, and hospitality. Finally, we thank Scott Bingham for assistance with qPCR and sequencing. This research was funded by an NSF grant from the Biodiversity Surveys and Inventories Program and by a USDA grant from the Soil Processes Program to FGP. IA, SJ, SB, TS, and YM participated in lab bench and/or phylogenetic work. FGP and SB designed the experimental approach. YM, SB, TS and FGP contributed to the drafting of the manuscript. All authors contributed intellectually to the ideas and data interpretations in this work. All authors read and approved the final manuscript.